A Florida State University research team has discovered that light can significantly alter the structure of a promising material that scientists believe could make more efficient light-emitting diodes, lasers and other photon-based technologies. 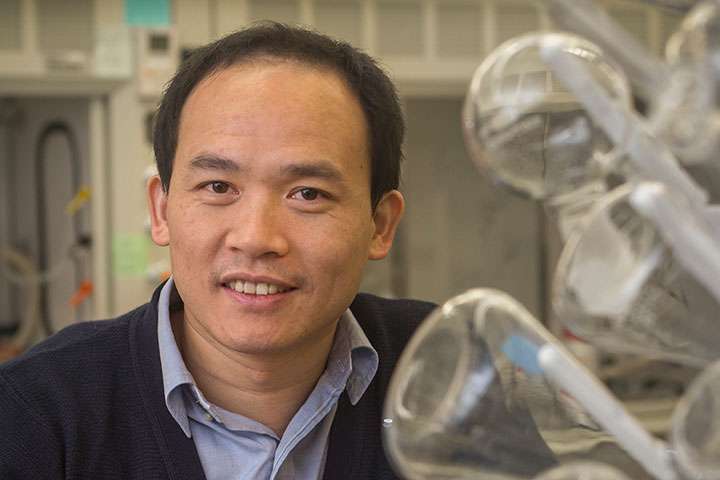 In the journal Angewandte Chemie International Edition, FAMU-FSU College of Engineering Associate Professor Biwu Ma explains how light can change a material called organometal halide perovskites from a 1-D to a zero-dimensional structure. Computational studies suggest this zero-dimensional structure is more energetically and thermodynamically stable than the 1-D structure, and thus could make for more effective technologies. Ma and his team have been working on organometal halide perovskites for the past few years with the hope to discover new functional materials that outperform conventional optoelectronic materials. A perovskite is any material with the same type of crystal structure as calcium titanium oxide, and hybrid metal halide perovskites have received increased attention in recent years for their potential applications in various types of photon-related technologies such as light-emitting diodes and lasers. In this study, Ma and his team assembled organic and inorganic components with the intent to form single crystals with both 1-D and zero-dimensional structures. "We have been developing new structures by treating the fundamental building blocks of this class of materials, metal halide octahedrons, as Lego pieces." Ma said. "Theoretically, we could use them to build 3-D, 2-D, 1-D, and even zero-dimensional structures." While much work has been carried out in the field of organometal halide perovskites in recent years, the focus has been mainly on 3-D and 2-D structures, with 1-D and zero-dimensional structures significantly underexplored. As part of this process, Ma's team discovered that light was actually capable of changing some of the 1-D crystals to a zero-dimensional crystal structure. "Our work not only shows our capability of producing low dimensional perovskites with high yields, but sheds light on the critical photostability issues of organometal halide perovskites," Ma said.